Also known as 'Terror of travelers', Carnivore Plants are indeed death machines! As little plants or enormous bushes they only eat meat and their teeth contain one of the most powerful poison of the world. Mingling themselves in the forest, they can move using their roots that aren't fixed in the ground as the ones of the common plants, but they are used as tentacles! 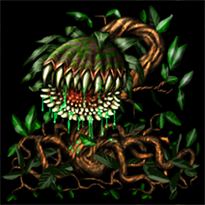 Despite their slowness, bigger Carnivore Plants can also throw them grasping the enemies and slowing them while preparing the final hit. Special Notes: The victims of this unit’s poison will continually take damage until they can be cured in town or by a unit which cures. This unit regenerates, which allows it to heal as though always stationed in a village. Last updated on Sat Apr 20 01:32:54 2019.